No stranger to animation, Voltaire is also a recurring character in the popular on-line game, AdventureQuest Worlds. Every Friday the 13th, Voltaire leads players (a server-crashing average of 35,000 at a time) on a live adventure in which he sings his songs with lyrics changed to match the monster-infested battles in the game. Finally, all of Voltaire’s age-appropriate songs are on one CD. 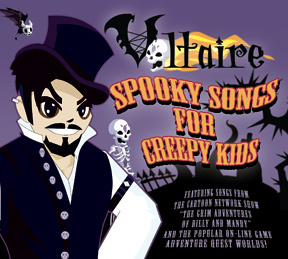 On this disc Voltaire compiles his songs from Cartoon Network as well as five of his songs from the AdventureQuest game. Sure to please fans and non-fans of Twilight alike is a never-before-heard version of his popular song, “The Vampire Club,” where Voltaire simultaneously embraces and skewers Twilight in a way only he can! Also included on this disc is a spooky lullaby Voltaire wrote for his son, “Goodnight Demonslayer,” which brings to mind British bandleader Henry Hall’s “Here Comes the Boogie Man” (made popular again by the video game BioShock2). “The Beast of Pirate’s Bay” is a song Voltaire wrote to perform at his son’s school Halloween fair. Rounding out the track listing is “Crusade,” a bit of fatherly advice where knights and dragons serve as a metaphor for the acceptance of diversity and other ideologies.